Printing support was added to Scheduler for WinForms in 2008 v3. At run time users can now print the schedule and view a print preview of schedule appointment data using the run-time context menu or buttons on the toolbar of the Appointment dialog box. Clicking Print will open the Print dialog box, which allows you to select the print style and print range before printing. Clicking Print Preview will open the Print dialog box, which allows you to select the print style and print range before previewing your selection. 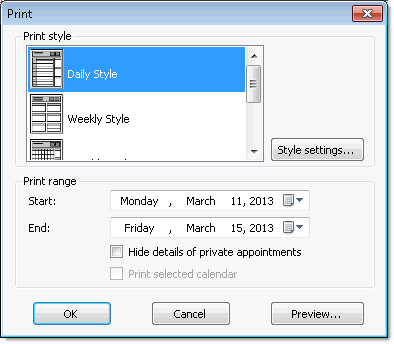 The Print dialog box includes options to select a print style (daily, weekly, monthly, details) and a print range. The print style can be customized by clicking the Style settings button and users have the option of hiding the details of private appointments. Note: If users select a specific appointment to print (right-click the appointment and select Print or Print Preview) the print range will not be visible and cannot be changed in the Print dialog box.